I had known Dave Hershberger for 18 years, and this seemed just the sort of thing he’d do. 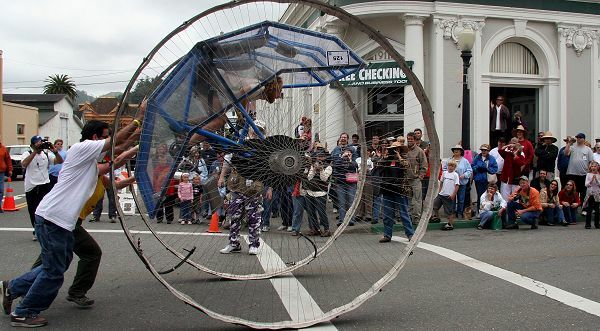 Having attended four Kinetic Sculpture Races, it was only a matter of time before he built his own entry. Dave’s creations of any sort tend to be wildly innovative, the result of disregarding proven knowledge others have acquired for the excitement of learning new lessons himself. A typical Kinetic Sculpture starts with a 4-wheel chassis which isn't anything special to look at, but solves the engineering challenge of getting through the race in one piece. To this chassis, pontoons or other flotation are fastened, often just for the water portion of the racecourse. Then the art challenge is mastered somewhat independently by an exciting shell of fiberglass, plastic, mylar, extruded foam, or whatnot, fastened onto the chassis. Dave never considered this design. Dave stepped back to first principles and addressed both challenges with one sculpture, unifying form and function. Wheels are a common element of essentially every entry, so he started there. In the tradition of “What Would Hobart1 Do?”, one could surmise there is little point in small wheels when one can have large wheels. The door on Dave's garage was 9 feet tall. Decision made! 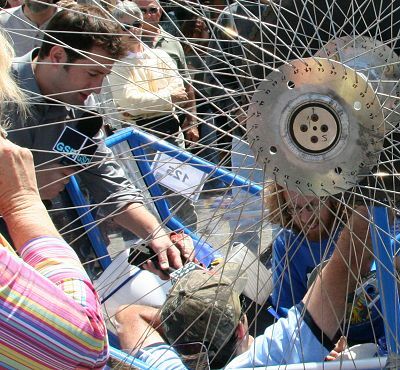 Since it’s not easy to build a 9-foot diameter wheel, the next question was how many were really necessary. A 9-foot unicycle seemed unworkable, so he settled upon the minimum quantity of them—two. And once one has a design with two 9-foot wheels, everything else starts to fall into place. There was no place outside the wheels to attach pontoons (except the axles—which would mean the pilots were underwater). Therefore, he decided to wrap the whole pilot assembly in metal frame covered in sealed quarter-inch clear acrylic plastic, creating buoyancy with classic hull displacement like an ocean liner, rather than pontoons like a barge. You can read his construction website for those details. To implement his design, he developed and employed welding, mechanics, plastics, physics, hydraulics, and buoyancy. From the beginning, Dave sensed that his design, although straightforward, might be a bit difficult to propel through the 42-mile race. Thus he christened it the Unwheeldy. To attend the 2004 race, we had made the mistake of flying into the nearest major city—Sacramento—where we stood in line at Budget Rent-a-Car for an hour before they jacked up the rate on our confirmed reservation and told us to take it or leave it. Then we drove north for 6 hours. 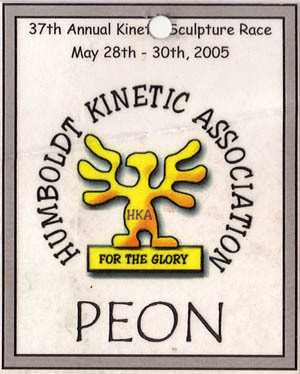 To attend the 2005 race, we did it right and took a puddle jumper straight into Humboldt County. That flight takes you back in time to when air travel was magical. You land at the airport, walk 50 feet across the tarmac into the terminal, and right there beside the baggage claim are the car rentals. Standing behind the one other customer to form a minimal "line" prompts the woman behind the counter to say "You must be Mr. Jones—welcome to Alamo! Sorry for the delay—I'll be with you as soon as I’m finished helping Mrs. Himmelfarb here." Ten minutes later, we had our baggage, our car, and were on our way, a magnificent welcome to the North Coast. Five of us comprised the team. Captain, Pilot, and Creator Dave Hershberger enlisted Copilot Matt Frost, Pit Crew Members Karen Wallace and Elena Eneva, and Peon Tom Jones (yours truly). 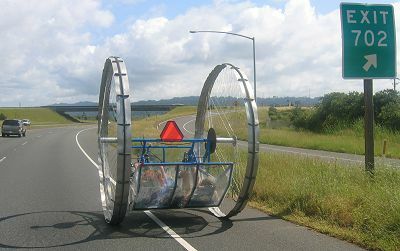 Unwheeldy was assembled in Pasadena, California, and accompanied Dave and Matt on a trailer for its 635-mile journey northward. Tom and Karen arrived by plane from Greenbelt, Maryland. Finally, at 1am the night before the race, the entire team was united with its vehicle in Ferndale at the grand old home of our hosts, Ellin Beltz and Ken Mierzwa. All seemed ready. Ellin Beltz creates some of the Glory awarded for the 2005 race. These are the ACE awards, consisting of the word “ACE” hanging from a wheeled chicken (just to the right of the torch). Pilots, crew, officials, and dignitaries are issued glory reflecting their achievements or contributions, and some pilots” chests tinkle with ACE and other glory from past races. Kinetic virgins like us have a single chicken. The crowd was thickening two hours before the noon klaxon that starts the race. Dave, Matt, and Elena unpacked Unwheeldy from her trailer and discovered that the shift cable attachment bolt for one of the rear derailleurs had failed. Dave and Matt called me to report the peril, then Matt dashed off to find a hardware store while Dave went to register. Elena and I tended to the sculpture while Karen decorated our three crew bikes with ribbons, streamers, flowers, spinning pinwheels, and duct tape. Dave obtained our race map, rules, t-shirts, and welded brass glory chickens (see right), but as other entries began their brake and safety checks in the square, our Team #125 was the only one without a sculpture. WATER SAFETY JUDGE: Floatation is.....? TOM (presuming some sort of word game, since our means of flotation seemed obvious): Important? JUDGE: I mean, how does your sculpture float? Even race officials were surprised by Unwheeldy’s engineering novelty. At 11:30am, Matt returned with hardware, which he began installing. At 11:45, Unwheeldy was complete, and Dave and Matt started pedaling her toward the square. A crowd of spectators immediately formed around the sculpture, asking all sorts of questions, foremost among them "How does it float?" To our surprise, even race veterans didn't recognize that the transparent plastic base of the sculpture would serve as a boat hull. The Game Show Network interviews Matt (wearing hat), and Dave (right side). At 11:52am, race officials guided us to our official parking space. Just as we finished backing in to prepare for the LeMans start, I realized we had not yet received our brake and safety inspection. I mentioned this to one gentleman bearing a clipboard, whistle, and no small amount of glory around his neck, and he bellowed "You're late! Get to the starting line for the safety test!" Blowing his whistle, he went before us as Moses, parting the sea of spectators, crews, and officials, as Unwheeldy hustled around the square in a mad dash to be the very last sculpture inspected at the announcer’s stand. As we sped around the town square, it seemed Unwheeldy would not have gotten more attention had it been on fire. As they glimpsed our huge spokes rolling past, some of the most famous faces in the Kinetic movement viewed Unwheeldy with open mouths. Two engineering Judges approached, giving it the once-over: "We've never seen this before!" "Very innovative design, reminiscent of the Killer Tomato2" The safety team ordered Unwheeldy to accelerate down the street, and a judge stood in front and ordered a sudden stop in front of the reviewing stand to prove that Unwheeldy had brakes. Dave clamped the brake levers, and Unwheeldy screeched to a rapid halt, with the crowd roaring as she rocked back and forth on 9-foot wheels. The pilots then evacuated the sculpture in a few seconds, another safety check. Cliff, the KHUM radio announcer said over the loudspeaker "How does it float?" and I shouted back "It's a boat!". At 11:58, summarily foregoing the pilot sobriety check, Unwheeldy dashed around the square back to her assigned space. Throughout the year, at noon determined by an atomic clock, the klaxon in Arcata goes off to remind the town of its presence in the event of emergency. Once a year, the klaxon starts the race. 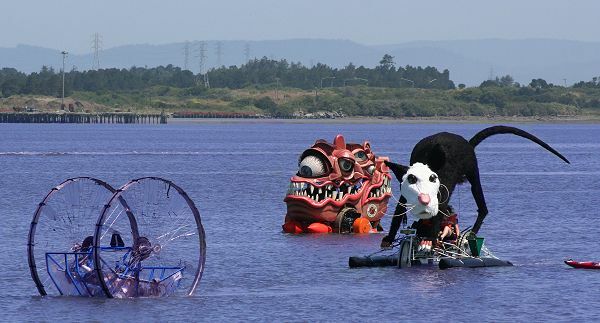 Every year, the World Championship Kinetic Sculpture Race starts precisely on time. The chaotic laps around the plaza at the start as the whistle was blown. In addition to Unwheeldy, you can see the Frill Seekers' Dragon and the Cyclops on the far right. Hay bales protect spectators from errant sculptures. 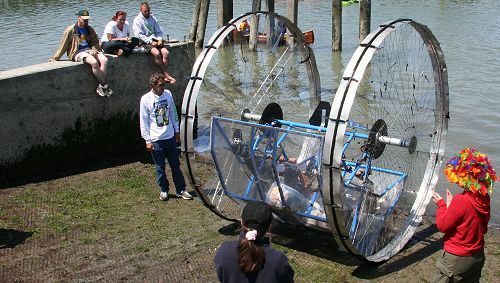 Unwheeldy was the only 2-wheel entry in 2005; Cyclops was the only 1-wheel entry. 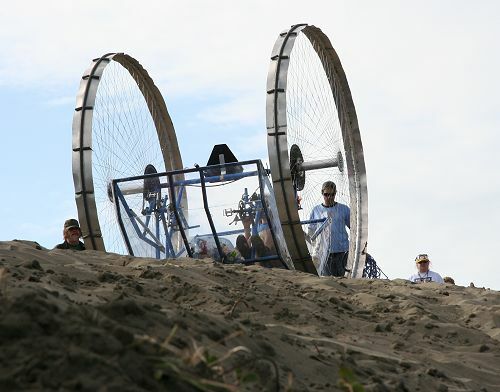 The pilot rode a unicycle the length of the course—even up the sand dunes—and carried a rubber raft for the water portion of the race. In a LeMans Start, the vehicles start in one place, the racers across the street. 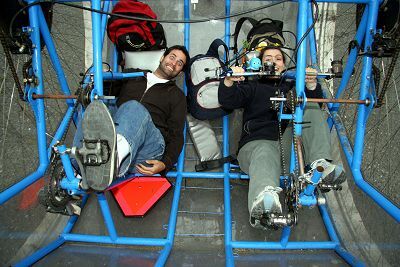 Less than one minute after Unwheeldy was in her space, the whistle blew, and dozens of pilots dashed for their sculptures, including Dave and Matt. As Unwheeldy set forth on her maiden voyage around the town square, we pit crew followed along. As we were passed again and again, we realized we were one of the slowest sculptures on the square. 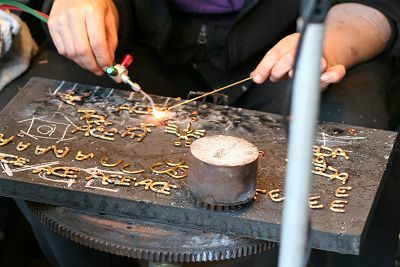 After a couple of laps of sculptures careening madly around the square as thousands of spectators cheered, the timers threw open the starting line and sculptures poured from the square onto the street beyond. As we passed, a policeman reached frantically in his pocket, pulled out his camera, and photographed our twin wheels rolling by. The racecourse heads out of Arcata toward the ocean along rural farm roads. Every quarter mile or so, a cluster of tailgaters cheered on the racers. We were passed by many a sculpture, and many of those passing took a photo of Unwheeldy, perhaps suspecting that we might not make it to the finish line. As Unwheeldy approached the turnoff for the beach, our position among the racers was approximately last. I had been racing ahead on my bike and moving traffic cones out of the way, for Unwheeldy was also the widest sculpture in the race. (Dave had found in the Race Rules that the maximum allowed width was 8 feet, and had designed her to be 7 feet, 11¾ inches.) At this point, I embarked on a stretegic mission, breaking from my crewmates and crusing off at high speed to reconnoiter Dead Man’s Drop. So I surged ahead on my bicycle. My bicycles at home are sized for my 74-inch height. At the KSR, my borrowed bike was built for someone somewhat shorter; riding it reminded me why bikes are made in different sizes. After I had bolted about 3 miles ahead of Unwheeldy, I realized I had left all my water with them. It would be a long way back, and I thought "What would Hobart do?" and decided to persevere, parched. A few miles later, I left pavement near Dead Man's Drop, and was exhausted. We had been up late the previous night reunioning and preparing. My mountain bike was no match for the trail’s loose sand, so I abandoned it in the bushes. I remembered drinking water could be purchased at Dead Man's Drop, so I ran along the trail, until I was so exhausted and dehydrated I had to stop to rest to avoid passing out, even though resting meant I’d get more dehydrated in the meantime. That’s when the cloud of mosquitoes that had been trailing me caught up. East of Dead Man’s Drop is the site of the second-worst mosquito infestation I have ever seen. (I had also been Dave years before when we found the worst.) This was clearly the least desirable spot in Humboldt county in which to pass out—before regaining consciousness I would be transformed through a series of miniscule blood donations into Tom the Human Welt. So I pushed yet further. Several minutes later, I came out of the bushes at the base of the great hill annually known as Dead Man’s Drop. I redoubled my efforts up the steep slope, resolving to purchase as much water as I could possibly need, and never to run out of water ever again. About a third of the way up the hill, through the haze of heat exhaustion, a woman called to me by name, probably repeatedly. I turned toward the voice and recognized a charming woman I had met at a Gone with the Wind party in Baltimore’s Little Italy two weeks earlier, where I had been wearing a southern gentleman white linen suit, and she an astonishingly broad hoop skirt. This was a more casual affair. After brief conversation, and introduction to her parents, I staggered to the summit. The scenery along the Pacific was beautiful as the waves crashed ashore. At this point, Dave and Matt had ridden Unwheeldy further than ever before—they had been so busy finishing the sculpture, there was no time for training rides. I bought two bottles, gulped them hastily, and started to feel better. I arrived to see the lead sculpture go down the drop. That morning at the starting line, many pilots were obsessive about the cleanliness of their sculptures. Like a hot rod owner, they’ll wipe off a bit of dirt, and care to avoid scratches. But by the time they get to Dead Man’s Drop, that attitude has given way to fatigue. The sculptures are sheathed in grime and sand, and the racers are sheathed in sweat and sand and no longer care. Once out on the Pacific beach, I ran north along the coast to reunite our team. However, Peons are not prevented from smoothing the track, so I scurried immediately ahead, removing bits of driftwood and assorted debris. It was obvious that ours was the widest sculpture through the dunes, for only the center of the path had already been smoothed by prior racers. An interesting shortcoming of Unwheeldy became evident on the narrow trail. In his extraordinarily simple and elegant design, Dave had configured the sculpture so the left pilot powered the left wheel, and the right pilot powered the right wheel. This "differential drive" avoided the need for a steering wheel—a turn to the right was accomplished by having the pilot on the left pedal faster than the pilot on the right. This design also allowed extremely sharp turns if one side of the sculpture braked while the other pilot pedaled. However, the tragic flaw of this design is that no human can pedal precisely as fast as another. Most vehicles are designed to go straight by default, and steering is added as an option. Unwheeldy had unstable steering baked into its design. Even on perfectly flat pavement, the merest bit of over- or under-enthusiasm by either pilot would cause the sculpture to turn toward one side. If there were a bump on one side of the road, she would lurch that way. In the dunes, this meant veering off the trail course, perpetually crashing into unsuspecting shrubbery. Driving straight was never so great a challenge. 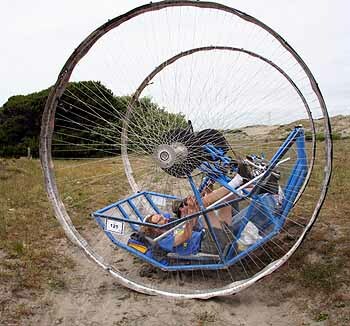 Unwheeldy's 2-wheel design also gave it an unusual method of surmounting obstacles. When the wheels came to a wide bump spanning the trail, they would stop rolling forward. 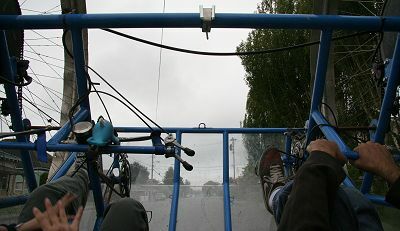 The carriage holding the pilots, however, would ratchet progressively forward and upward, until enough gravitational potential energy had accumulated to cause the entire contraption to lurch forward over the obstacle, when the carriage and pilots would swing back down as the wheels rotated, converting the gravipotential into forward momentum. The dunes were the first lumpy terrain we encountered, and there was a great deal of lurching and swinging. When not lurching or swinging, crew did a great deal of leaning to avoid rolling backward. Sometimes, a small obstacle would cause Unwheeldy to make a dramatic turn off the trail. Note that the wheels are not as perfectly round as in the preceding photos. The first day’s finish line lay on the other side of the dunes, beyond Dead Man’s Drop, over the Samoa Bridge, at the Eureka town square. Pragmatically, there was no way we would make it in time; even on pavement, progress was simply too exhausting. But an even bigger problem presented itself. As we climbed hill after hill, with the ratcheting-lurching-swinging motion, Dave noticed that his chain was coming loose. A closer investigation revealed that the frame itself was bending. Before building his design, Dave had conducted a detailed strength analysis of every structural member. In places where the structure needed to bear more weight, he reconfigured the design for greater strength. However, after he began putting the sculpture together, he realized it would be nice if pilots shorter than six feet tall could drive it. So he made the pedal position adjustable. Unfortunately, in adding that adjustability, he introduced an Achilles heel absent from his prior structural analysis. During periods when the sculpture ratcheted upward to accumulate potential energy to surmount an obstacle, all that energy was channeled directly through the steel tube supporting the pedals, which was merely 1.5 inches in diameter. And that tube was bending. We stopped and considered our situation. It was agonizingly obvious that we would not be able to make it up the remaining dunes without forcing the tube to bend so far Unwheeldy would be unridable. Further, there was no spare tube among our spare parts. Fixing the problem would require finding a replacement (we did not have a spare tube), and welding it in place (we did not have a welder). The outlook was grim. While pausing to contemplate certain doom, we heard a motor over the horizon. A Unimog—a giant elevated motorized dune buggy contraption that laughs at the feebleness of other SUVs—drove down the trail and stopped in front of us. Out sprang its driver, festooned with Glory, and an official badge reading “Aly Krause, ACE JUDGE”. In the blink of a moment, he assessed the situation, and said “You guys are in a pickle. I’m afraid if you can’t proceed I’m going to have to disqualify your ACE.” We grunted miserable agreement. He continued, “Guys, this is an incredible work of engineering, and we all want to see it cross the finish line. It looks like if you just bend the bar back straight, add a triangular support here, and add another support here, you’ll be back on the road and can finish the race. I've got a welding shop in Eureka. If you want to bring it there tonight, we’ll straighten you out." We soon learned Aly is one of the most experienced racers in Humboldt, and he’d won more Speed awards than anyone else. (That speed rule quoted above is named after him. ) We later learned that one of the spectators who saw us break down was one of the HAMMs—amateur radio operators who support the race operation by keeping an eye on the racers. They keep an extra-close eye on any sculpture signed up to ACE the course, and had sent word on the radio that "Big Wheels" was in trouble. Aly was the ACE judge summoned to witness our breakdown and cross us off the ACE list. But, in the fabulous Kinetic spirit, he was also our rescue. Relieved of the pressure to ACE, the rule against pushing the sculpture no longer applied. The Peon could push, too. Working together, we heaved Unwheeldy to the top of Dead Man’s Drop. Looming over Dead Man’s Drop, Unwheeldy prepares for descent. We learned race officials had actually increased the height of Dead Man's Drop for the 2005 race. If you haven’t seen the site, it’s a giant sand dune, as steep as sand will tolerate—geologists call it the “angle of repose”. Just climbing Dead Man’s Drop on foot is exhausting. And in order to ACE, a sculpture must drive down the dune, turn to the right partway down, and steer into a tunnel through the bushes at the bottom of the hill. It was obvious why three sculptures had flipped over so far. With our exhausted pilots, we envisioned the nightmare that could result from a crash—a 9-foot wheel bent into the shape of a taco would be far more than could be rebuilt overnight even in Aly’s Sculpture Garage. We decided to play it safe as many others had done, and descend on a rope. A line was tied, and a team of seven volunteers lowered her down the slope. With Dave at the helm, Matt, Karen, Elena, and other volunteers lower Unwheeldy down the treacherous slope of Dead Man's Drop. At the bottom, we soon discovered that, while volunteers had worked hard to ensure a trail wide enough for most sculptures to pass, it still narrower than Unwheeldy. As we heaved through the brush, the spokes ripped down more than a few branches, further widening the trail. Once back on pavement, finishing on time was laughably impossible, so we made arrangements for dinner. We found a nice restaurant in Eureka with a sign on the door: “We Welcome Kinetic Sculpture Racers!” Covered with mud and sand, at the end of one of the most exhausting days of my life, I was still wearing my race credentials and glory as I approached the hostess and said “Do you have a table suitable for six incredibly filty, unbathed, tired racers?” The hostess said “Yes! Of course! Welcome to Hurricane Kate’s!” As our team entered, we became the subject of attention, and a few patrons approached and asked about our sculpture and race experience. One anonymous patron treated us to a round of drinks. Exhausted, filthy, and with a broken sculpture on a trailer parked outside, we nonetheless felt triumphant. Other sculptures splashed into the water with fanfare. The crowd was clearly having a good time. Rampmeister was performing his traditional role ensuring order and efficiency at the site. I was out on the pier, taking photos as sculptures entered the water. Suddenly, my watchband broke, and my shiny purple metal watch crashed to the decking, bounced several times, and landed in the water with a ker-sploosh. One of the other photographers said “Did you just drop a fish?” Today, my watch remains at the bottom of Humboldt Bay. Unwheeldy made it to the front of the queue, and the crowd cheered as Rampmeister blew his whistle and Dave and Matt began rolling down toward the water. The crowd roared with cheers and applause as they gently splashed and the plastic paddles began propelling. But then, the crowd’s roar changed. Unwheeldy had bogged down in mud. 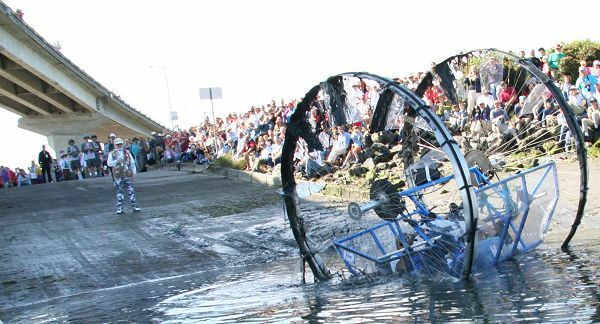 A very large gob of mud was scooped by one of the 8x14-inch paddles, and the crowd began shouting “Oooooohhhhhhh!” as the mud climbed the giant wheel. Inside the sculpture, Dave and Matt only heard the changing voice of the crowd, wondering what they were witnessing, when that great gob of stinky baybottom slid off the paddle and landed on Dave. The crowd exploded with laughter as Unwheeldy headed for deeper water. In the shadow of the Samoa Bridge, Rampmeister (standing) laughs with the crowd as Unwheeldy leaves the mud at the water's edge. You can see the muddy paddles on the top of the wheels. After photographing more sculptures entering the water, Karen, Elena, and I set off on our bicycles, heading south a few miles to where racers return to land. Dave and Matt were overtaken on the water by Extreme Makeover, Duane Flatmo's fabulous four-seater polyeyed hypertoothed monster, and Scaredy Cat, June Moxon's giant feline. Unwheeldy was more at home on water than land, and the spoke-mounted paddles provided ample, effective propulsion. Unfortunately, Matt and Dave were exhausted from the previous day's massive racing and welding until midnight at Aly’s shop, so their progress was not swift. 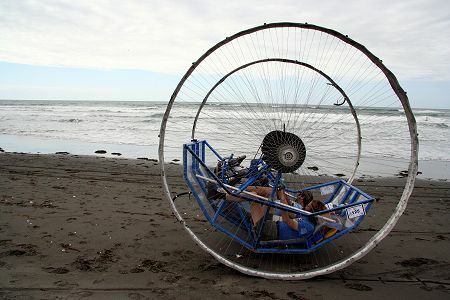 They also discovered the giant wheels caught more wind than hoped. Every time they stopped pedaling for even a moment, the vicious headwind reversed their progress. There was no rest for the weary. The water exit is where she was the most wieldy. On this algae-covered boat ramp, it’s typical for sculptures to slip and slide, or to need reconfiguration like pontoon removal or fiddling with valves. Unwheeldy, on the other hand, just drove right out of the water in a feat of unsurpassed amphibiousness. The ACE rules have a great deal to say about water exits, with good reason. For a variety of technical reasons, most sculptures—even the best—have difficulty, so ACE judges are on particular lookout to disqualify sculptures unable to exit without pushing. The upper part of the take-out ramp is even a push-legal zone. But when Unwheeldy came to the ramp, she just puttered right up the ramp with nary a care, to the surprise and applause of onlookers. The crew—Karen, Elena, and I—were ready to go on. The pilots—Matt and Dave—were not. This seemed a good time to get provisions, so Karen and Elena and I biked to town for water, snacks, and first aid supplies. When we returned, we found Matt so exhausted he’d fallen asleep in the only shade available—under a parked semi-trailer. But some official woke him, expressing the wacky phobia that the trailer might collapse on him. No longer trying to ACE, we could also swap pilots. Elena and I took over pedaling for a while. We started where the racecourse left pavement and entered a single-lane dirt road. There we experienced first-hand the indescribable frustration of driving the sculpture. The pilot's eye view shows just how unwieldy it was. This is not a typical dicycle built for two. Unwheeldy is unique in many ways, but its most distinctive oddity is that her pilots lie on their backs, just a few inches off the ground. Spectators were amazed at the profoundly laid back posture, quipping “That’s the most comfortable sculpture to drive!” or “Laying down on the job?” Other racers knew better. You’ll recall that our ancestors have walked upright for some time now, and evolution has kindly responded with a circulatory systems quite effective at enabling our legs to provide a great deal of power while pumping blood. However, one design concern is that system requires our legs generally remain below our hearts. I won’t trouble you with details, but there are vein valves and whatnot designed to keep blood circulating as leg muscles contract and relax. This means legs get tired, stiff, and sore very quickly when pedaling above the heart. Lance Armstrong was wise not to ride his bicycle upside down. As further challenge, laying on your back makes it difficult to see where you’re going. Yet another factor is that the boat hull acrylic is somewhat reflective, so the curved shape is generally like one of those parabolic solar water boiling devices. Unwheeldy’s hull concentrated the sun onto all sides of her pilots for a nice even roasting effect. A fourth factor involves acoustics. When you’re in the carriage, you can’t hear a darn thing from the front or back—even from just a few feet away I had to bellow with maximum enthusiasm to have a chance of being heard. The pilots are acoustically isolated. The only way to be heard from outside Unwheeldy is to come around the side and holler through the spokes. But most important, the critical fifth factor is that one cannot overstate the frustration inherent in multi-pilot differential drive. If one pilot or the other goes just the teensiest bit faster than the other, the sculpture begins pitching to one side. This is bad enough on wide, flat terrain. But on a dirt road just slightly wider than the sculpture (and in parts, narrower), high-precision synchronized pedaling is required, which adds serious mental exhaustion to the requisite physical exhaustion. As Elena and I were in the thick of heaving along the "road", from out of nowhere a gentleman of more than a few years leapt in front of us, exclaiming "Happiness Checkpoint!" To prevent chicanery, the race organizers place checkpoints at a few of the most likely places an illegal shortcut might be taken. At this checkpoint, the telling of an original joke was required. As we were all either exhausted or heading that way fast, comedy was low on our agenda. We stammered for some time before Karen finally blurted out the old one about the interrupting mathematician4. On the trail, we also found a cellphone belonging to the Area 51 team, and identified the owner when his teammates kept calling us. (It’s amazing, how hard it can be to convince someone that you’re not a cellphone’s owner. ) We got the phone back to Area 51 later that day, good karma for when I was to leave my backpack at Crab Park and have it returned at the finish line by Race Official Tina. Out for a leisurely Saturday jaunt along the freeway. This photo was taken from my bicycle in the right traffic lane. We went on our way, and Matt went off to sleep in his truck in Eureka, leaving the other four of us to brave US Highway 101. The other sculptures rode on the freeway shoulder; then again, the other sculptures were narrower and easier to control. From bicycling, I knew that a lane is either occupied completely or not at all, and since we didn't really fit on the shoulder, I wore my bright yellow shirt and rode my bicycle in the right traffic lane so cars would pass Unwheeldy in the left lane rather than skimming mere inches away in the right lane. Our travel was pleasantly death-free for a few miles, but we decided that since we were rapidly approaching the time at which the course was allegedly closing, we awakened Matt via cellphone. He came to fetch us with his pickup truck and trailer. And once we were all bundled up in our vehicle, it seemed reasonable to head straight for Crab Park, where we parked the sculpture in preparation for the evening's Kinetic festivity. Awakening Sunday morning, we were informed by race officials that the racecourse was altered, as the customary route up the slough was not available. Instead, sculptures would cross the Eel River over the Fernbridge—a long, barely 2-lane viaduct from the highway to Ferndale. Further, because the bridge would be closed while sculptures crossed, all sculptures would cross together. Any sculptures with the habit of not arriving at finish lines on time (e.g., us) were told to make arrangements to ensure non-tardiness at the bridge. Unwheeldy seemed particularly easy to drive that last day for Matt and Dave. Perhaps because they had only a few miles to go, or perhaps because we had removed every last bit of equipment from the carriage in preparation for what was coming at the finish line, the guys zipped along so fast that a speedy jog was required to keep up with them. As we made the final turn onto Main Street for the approach to the finish line in downtown Ferndale, they seemed to redouble their effort again, and were really rolling along. As you enter Ferndale, the crowd thickens the closer you get to downtown, louder and more enthusiastic with every block. Finally, the finish line comes into sight, the sidewalks filled with people on both sides. It is customary to make a final flourish as a sculpture crosses the finish line—a 360-degree turn looping around in the intersection right before crossing. We rotated along a different axis. A few feet before the finish line, we stopped the carriage, and Matt jumped out. Then Dave locked the brakes, and Matt and Karen rocked Unwheeldy back and forth swinging further and further each time. The volume of the cheering crowd got louder with every swing. Finally, with enough momentum engaged, they pushed Dave up into the air, and he went over the finish line upside down. To the roar of applause, and with every eye in the crowd on Dave, he did a 360° roll and finished the race like no one else. The Engineering judges were very impressed with Dave’s inspirational genius, and more than one person that weekend said Dave reminded them of Hobart Brown, in his tendency to build outlandish designs that are comical by their very nature, to persevere with those designs no matter how improbable they might seem, and to convince friends to go along with the entire improbable plan. All of the customary awards for engineering, however, required that the sculpture also ACE to qualify for consideration. But they called us to the podium nonetheless. 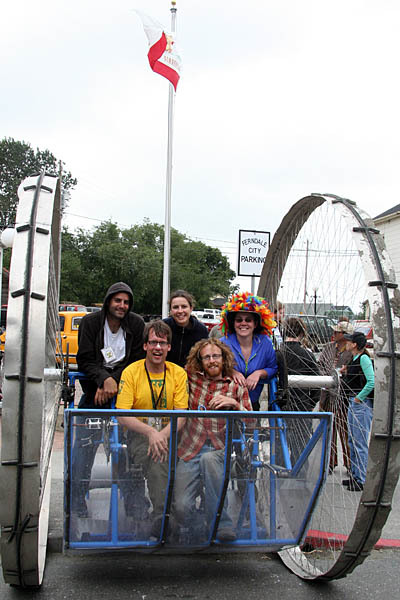 We were thrilled to find that Unwheeldy received the first Honorable Mention for Engineering in the 37-year history of the Kinetic Sculpture Race Championship. I also received a great personal honor at the awards ceremony. Hobart himself presented me with the title of Kinetic Seer, and I share this title with only 30 others throughout the world. The Seer amulets are the only glory Hobart makes himself these days, and I will be very proud to bear the Seer Glory at future Kinetic races on all coasts, and to continue to do what I can to make the world more Kinetic. There are obviously many lessons from Unwheeldy’s first race! Mad Captain Dave is already contemplating the design changes necessary to ACE in 2006. If you’re at the race, and see us at the beginning or end of the day, you might even have the special experience of driving her for a short distance. Come say hi! Ellin Beltz and Ken Mierzwa for providing the endless support and know-how required for an out-of-town team of Kinetic Virgins. Ace Judge Aly Krause for providing welding equipment, a lab, and advice in Eureka. Tina, for reuniting me at the finish line with my camera backpack I left behind in Crab Park. In Kinetics, when you inadvertently abandon baggage stuffed with valuable equipment, it finds its way back to you. Rampmeister Blake, generally for maintaining safety, order, and efficiency at the water entry and finish line, and specifically for orchestrating a safe crowd perimeter at the finish line so we could roll Dave upside down over the finish line without killing anyone. The anonymous patron who treated us to a round of drinks at Hurricane Kate’s. Finally, Hobart Brown for starting this whole Kinetic thing. Hobart Brown, creator of the Pentacycle in 1969, the first Kinetic Sculpture in Ferndale. Killer Tomato was a sculpture built in 1996 by Bob Durst, who also has a webpage. 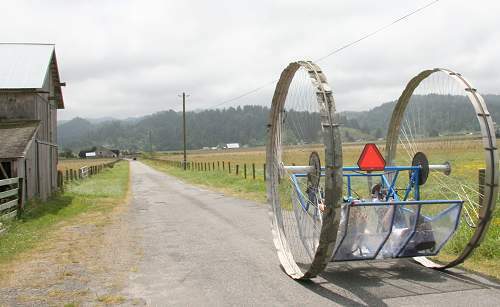 The Killer Tomato had raced in Port Townsend, Washington, and had no connection to the Unwheeldy other than a similar, independently-created design. You can read the full official rules for the California race or for the Baltimore Race if you are so inclined.